Following religious rules instead of focusing on a relationship with Jesus is something many believers do. We trade in the complete and perfect gift of Jesus for a list of to-dos on how to perform and earn God’s favor. But when we focus so much on perfectly executing rules, we lose sight of the One who truly sets us free. 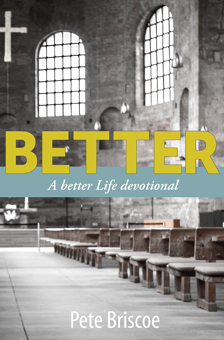 We want to give you a daily reminder of how Scripture calls us to a BETTER life with a copy of Pete Briscoe’s new book, A Better Life Devotional. Successfully added A Better Life Devotional to your cart.